Despite our best efforts, most of us have dealt with fleas on our pets at some point. But why, how do our pets get fleas? Well, your pet can pick up fleas a number of ways. One of the most common ways is from your pet just going outside and playing, or from just taking a daily walk. Even though you may be diligent about spraying your yard and keeping it pest-free, it doesn’t mean that your neighbors are. Wandering off to check out someone’s yard can mean fleas for your pet, so keep your pet close to you and use a leash that doesn’t allow your pet to wander wherever he or she wants. Another way your pet can get fleas is from warm, dark, moist places. The main culprits are woodpiles, leaves and grass clippings. With spring finally here and the snow melting away, these damp areas make an excellent hideout for fleas. When your pet walks by or lies by one of these places, fleas can jump up on your pet’s fur and hitch a ride. That’s why it’s important to keep your yard debris free and to spray for fleas when the weather starts warming up. Along with dark, warm places, another animal’s den is also a great place for fleas to be hiding. Feral cats that may be roaming the neighborhood and even wild animals such as rabbits, raccoons and possums are carriers of pesky fleas. Therefore, when your curious dog or cat wants to go sniffing around, fleas are ready to pounce on the next warm-blooded creature. Lastly, kennels are the perfect place for your pet to pick up a flea or two – or many more. Busy pet parents just like you need a safe place to leave their pets, which means a lot of dogs and cats to play with, and unfortunately a lot of fleas hanging around. 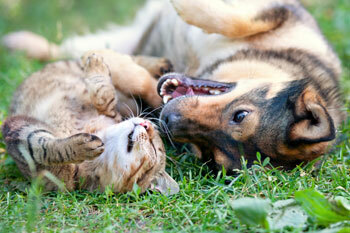 Fleas are an itchy nuisance to not only your pet, but to you as well. Plus, they can cause dangerous parasites. That’s why it’s so important to make sure your pet is always protected with a flea preventative like Flea4X Plus, Advantage II, K9 Advantix, Frontline Plus, or Cheristin for Cats. Now that you know some of the common ways pets can contract fleas, learn the 4 important benefits of using flea preventatives each month.